The black-and-white horror film about a half-man, half-amphibian first swam into theaters in 1954. Today, the 3D film is widely considered one of the greatest monster pictures ever made. 1. The Movie’s Concept Was Conceived at a Citizen Kane Dinner Party. One night during filming of Citizen Kane, Orson Welles invited one of the movie's actors, William Alland, over for dinner along with a cinematographer named Gabriel Figueroa. While there, Figueroa shared a story he had heard during his travels of a race of amphibious beasts—half man, half reptile—that stalked the Amazon River. More than a decade later, still intrigued by the concept, Alland dramatized it by producing Creature from the Black Lagoon. 2. The Creature Was Modeled After the Academy Award. Universal managed to snag an up-and-coming filmmaker with a prestigious resume to direct the film: In 1951, Jack Arnold’s documentary With These Hands had received an Academy Award nomination. Though he didn’t get the Oscar, Arnold kept the souvenir certificate that the Academy always mailed to its nominees. The little card would go on to become an unexpected source of inspiration behind the scenes of Creature from the Black Lagoon. 3. Part of the Film Was Shot on Location in Florida’s Panhandle. Observant viewers may have noticed that the film's Amazon looks a lot like parts of the greater Tallahassee, Florida area. Though Creature from the Black Lagoon was mainly filmed in Hollywood, several river and underwater sequences were shot at Wakulla Springs State Park. 4. A Former Frankenstein Actor Turned Down the Main Role. When Boris Karloff retired from playing Mary Shelley’s reanimated monster, Glenn Strange took over. From 1944 to 1948, Strange terrified audiences in Universal’s House of Frankenstein, House of Dracula, and Abbott & Costello Meet Frankenstein. Years later, the studio tapped him to play their web-footed “Gillman” in Creature from the Black Lagoon, but because swimming wasn’t his forte, Strange declined the part. 5. The Gillman’s Designer Didn’t Get Her Due Credit. Millicent Patrick’s huge contributions to the horror genre have been largely forgotten, even by die-hard fans. Her talents were numerous: Patrick acted in 21 films, drew concept art for countless others, performed as a concert pianist, and became the first female animator that Disney ever hired. Before Creature from the Black Lagoon, she’d sketched various monster body parts for Universal. The Gillman gave her an opportunity to really shine, as Patrick was responsible for designing every inch of the creature’s body. As part of the film's ad campaign, Patrick posed with Gillman masks and sketches for some publicity shots. But makeup artist George Hamilton “Bud” Westmore, didn't want to be upstaged. He falsely claimed that he was the beast’s sole designer and made sure that Patrick’s name stayed out of the opening credits. 6. Two Slightly Different Suits Were Built. 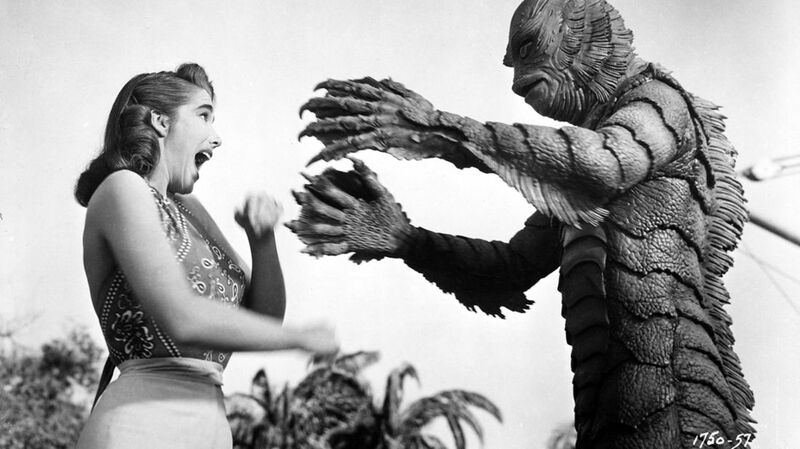 Browning said “yes,” but soon learned that portraying the monster would be a two-man job: While the Floridian did all of the Gillman’s underwater scenes, Ben Chapman played him on dry land. This presented a few technical challenges: While Browning stood just under six feet in height, Chapman was an imposing 6’ 4”. Clearly, they couldn’t share a costume. So full-body molds of both actors were made, which formed the lowest layer of each man’s creature suit. Due to the height disparity, there are a few subtle differences between the outfits (Chapman’s, for example, came with an extra chest plate). 7. Restricted Eyesight Became a Big Challenge for the Creature Performers. Chapman, too, suffered from eyehole problems. Near the finale, the creature carries a passed-out Kay Lawrence (played by Adams) through his cave. Since Chapman’s peripheral vision was limited, he accidentally slammed Adams’ head right into an artificial rock. “I was of course being carried with my eyes closed and, all of a sudden, I had a bump on my head,” Adams recalled. Luckily, she was unhurt and shooting resumed a few hours later. 8. Studio Execs Demanded that the Striking “Creature Theme” Be Replayed Ad Nauseam. Film scholar David Schecter estimates that the tune gets repeated around 130 times (listen for it at 0:35 in the clip above). As Schecter notes in Back to the Black Lagoon, the movie’s three composers—Henry Mancini, Herman Stein, and Hans J. Salter—were “told from on high ... ‘We want to hear the creature theme every time.’ So they no doubt grumbled a little and they did their job and their job was to incorporate this very intrusive theme.” Viewers won’t find a single Gillman sequence in which they don't hear that refrain. 9. Its 1955 Sequel Was Clint Eastwood’s First Movie. 10. The Gillman Enjoyed a Quick Appearance on The Munsters. During the first season episode “Love Comes to Mockingbird Heights,” television’s spookiest family received a crate filled with their Uncle Gilbert’s rare doubloons. In the final scene, Gilbert shows up and is revealed to be none other than the creature from the Black Lagoon (as played by Richard Hale, who dons both a Gillman mask and a three-piece business suit).